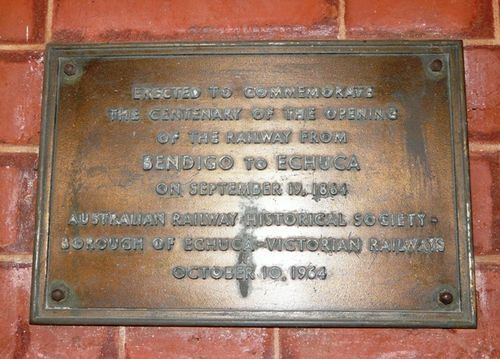 A plaque commemorates the centenary of the railway from Bendigo to Echuca. The Bendigo line was extended to Elmore and Echuca in 1864, and across the Murray River into New South Wales in 1876 to connect with the private Deniliquin and Moama Railway Company from Moama to Barnes and Deniliquin. The company was taken over by the Victorian Railways in 1923.